Afghan refugees, who have made the difficult decision to voluntarily return home to Afghanistan, some after decades living in Pakistan, here pictured at UNHCR's voluntary repatriation centre in Peshawar, which provides administration and services to help them go home. 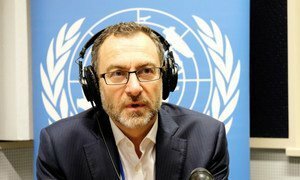 Afghanistan has undertaken significant reforms which the international community will continue to support long after peace is secured in the war-torn country, a top UN official pledged on Wednesday. Speaking to journalists on Wednesday at the end of the Geneva Conference on Afghanistan, Mr. Tadamichi Yamamoto, head of the UNAMA Assistance Mission and UN Special Representative in the country, confirmed that the issue of an end to extremist violence had been discussed in depth. “Perhaps this was the first ministerial meeting when the issue of peace has been taken up with so much weight in addition to the regular issues which are development, growth, social issues and reforms,” he said. Mr. Tadamichi’s comments follow the Afghan Government’s pledge earlier this year to hold unconditional talks with Taliban groups. Extremists have been held responsible for innumerable deadly attacks on civilians in the country, including one earlier on Wednesday in Kabul, reportedly targeting the premises of a private security company. Also in Geneva, Afghanistan’s National Security Advisor, Dr. Hamdullah Mohib, insisted that the people of Afghanistan were “ready for peace." The Taliban were ready too, he suggested, owing to increased military pressure on them throughout Afghanistan and the fact that they had “lost their legitimacy” in the eyes of citizens. Those comments came at the end of a high-level conference on Afghanistan at the UN in Geneva attended by 67 countries, 34 international organizations and representatives from civil society and the private sector. Its outcomes included the adoption of the Geneva Mutual Accountability Framework (GMAF), a list of commitments for the Government and international community to achieve by the end of next year. These include enhancing inclusive economic growth, reducing poverty, creating employment, fighting corruption, empowering women more, and improving governance, rule of law and human rights. Earlier in the day, Afghan President Ashraf Ghani acknowledged that his country had received considerable support from the global community, having been the focus of 11 similar meetings in recent years, from Tokyo to London. Since the turn of the century, much had changed for the better, he insisted, not least the fact that Afghan men and women had voted on 20 October in parliamentary elections, despite the actions of armed extremists intent on spoiling the poll. “There is no better demonstration of the emergence of the active citizen than the long line of voters we witnessed on October 20 who defied threats of violence and rocket attacks to cast their ballot in the Parliamentary elections,” he said. People were increasingly “embracing and appropriating the values of the Constitution," President Ghani continued, before noting that young men and women – the “most educated and socially engaged generation ever," were helping to secure Afghanistan’s peaceful future. Echoing those comments, UN Secretary-General Antonio Guterres reaffirmed the organization’s partnership with the Government and people of Afghanistan “for peace, inclusive growth and sustainable development." In a message delivered to the Geneva conference by Under-Secretary-General Rosemary A. DiCarlo, Mr. Guterres noted how Afghanistan had “rebuilt” its political system, state institutions, infrastructure and economy since 2001. These changes had brought “notable improvements” for ordinary citizens too, he added. Considerable progress had also been made in women’s rights, the UN chief continued, not least in increased legal protection for them and their participation in politics and the economy. Such inclusion “is essential to helping Afghanistan reach self-reliance," he said, before declaring that he was “heartened by the courage and determination shown by the millions of Afghan women and men who turned out to vote” in last month’s parliamentary elections. In 2016, donors pledged more than $15 billion to help Afghanistan achieve those objectives over four years, and the conference provided an opportunity to take stock of Government-led reform at local and national level, across all regions. Nonetheless, “serious challenges of insecurity, poverty and the rule of law persist” in Afghanistan, the UN Secretary-General said, adding that finding a political solution to the violence there “is more urgent than ever." A high-level international conference on Afghanistan got underway at the UN in Geneva on Tuesday to show solidarity for the war-torn country’s people and help strengthen Government efforts to promote development, along with wider peace and security. 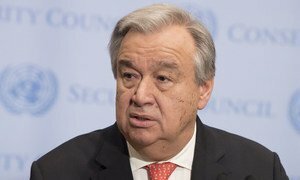 United Nations Secretary-General António Guterres has “strongly condemned” the terrorist attack targeting a religious gathering in the Afghan capital, Kabul, which claimed dozens of civilian lives.